The Lake Erie College of Osteopathic Medicine (LECOM) is the nation’s largest medical college and is the only Academic Health Center in the osteopathic profession. 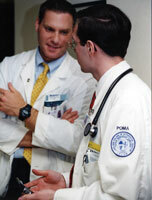 Physicians and administrators at the Millcreek Community Hospital saw the growing demand for more physicians and opened LECOM in 1992. With the college and the hospital as the core of a highly innovative medical education system based in Erie, Pa., LECOM has strived to add to the quality of life of our neighbors by bringing total health care to the community. The College brought a new concept in medical fitness and wellness to Erie, built a network of physician offices and has started construction on a senior living center that is introducing a new model of health care for older adults. LECOM offers innovative and affordable education in osteopathic medicine, pharmacy and dental medicine. From campuses in Erie and Greensburg, Pa. and Bradenton, Fla., LECOM provides student-centered pathways to prepare the next generation of health care professionals. LECOM is a private college with its main campus in Erie, PA, with an additional location, LECOM at Seton Hill, in Greensburg, PA; and LECOM Bradenton, a branch campus in Bradenton, Florida. The nation has a growing demand for new doctors, dentists and pharmacists, and LECOM’s mission is to prepare health care professionals trained in the osteopathic tradition of competent and compassionate, whole-person primary care. To prepare students for the challenges of modern medicine, LECOM recognizes that students learn in different ways. The LECOM Erie Campus is the only medical school in the country with five student-centered learning pathways for the first two years of education in osteopathic medicine. LECOM offers ground-breaking new curriculum to attract more students to family medicine and primary care specialties. LECOM’s Primary Care Scholars Pathway will condense four years of medical college into a highly structured, three-year curriculum, focusing on skills needed to become a family doctor or primary care physician. The Accelerated Physician Assistant Pathway (APAP) is a three-year program for certified PAs who want to increase his or her medical knowledge and practice independently as fully licensed physicians. The Lecture-Discussion Pathway (LDP) presents the basic science core curriculum and medical systems curriculum through lecture presentations and small-group workshops and laboratories. The Problem-Based Learning Pathway (PBL) is a nationally recognized innovative approach to medical education, offering students the opportunity to study the biomedical and clinical sciences by utilizing medical case studies in a small-group environment. The Directed Study Pathway (DSP), originally the Independent Study Pathway, offers students the opportunity to study the basic science core curriculum and medical systems curriculum at his or her pace, using lists of highly structured learning objectives compiled into self-directed learning modules used in combination with textbooks, resource guides and small group study. LECOM Bradenton and LECOM at Seton Hill offer Problem-Based Learning exclusively. Consistent with LECOM’s core value of creating student-centered education, three distinct learning pathways are offered for the Doctor of Pharmacy (PharmD) Degree which provides students the option of choosing a pathway most suited to their learning needs. Or students may study online in the four-year distance education pathway where they take the majority of courses online and attend classes for a few weeks each summer in Bradenton to meet laboratory and casework requirements. The Doctor of Dental Medicine curriculum is a unique, innovative approach to preparing future dentists. Year four takes the students to community-based dental offices in Erie, Pennsylvania and DeFuniak Springs, Florida. The LECOM Erie Campus offers a Post Baccalaureate Certificate Program with two semesters of biomedical science courses designed to improve a student’s academic credentials prior to entering medical, dental or pharmacy school. This two-year, MS degree provides graduates with the knowledge and credentials to gain placement at a variety of academic institutions, hospitals and medical education facilities. Available through distance education, the Masters in Healthcare Services Administration (MHSA) prepares administrators prepared to meet the challenges of managing hospitals, pharmacies, public health organizations, and private practices. The Master of Science in Medical Education provides courses in effective teaching, administration and leadership to those who desire advanced training in medical education. The program is open to physicians, pharmacists, dentists and basic science faculty. Candidates in the MS Med Ed program are prepared to become medical educators who teach in post-graduate medical education, as preceptors in clinical education, or as faculty at medical, pharmacy or dental schools. LECOM created the Lake Erie Consortium for Osteopathic Medical Training (LECOMT) to develop new osteopathic post-graduate training programs. LECOMT began with one hospital and a handful of residency programs and has increased to include 41 teaching hospitals/office sites in seven states, with more than 900 internship, residency and fellowship positions available. Physicians who teach at these affiliates and elsewhere may extend his or her medical education knowledge by enrolling in the LECOM Master of Science in Medical Education program. Tuition is free for residents at Millcreek Community Hospital, and LECOM provides tuition discounts for faculty at LECOMT member hospitals. LECOM encourages student involvement and leadership in community service activities. Programs such as Bridging the Gaps take students out of the classroom to underserved clinics and community agencies. LECOM has opened a medically integrated health and wellness center near the campus. Open to students and the public, the John M. and Silvia Ferretti Medical Fitness and Wellness Center, located at 5401 Peach Street, Erie, PA, is also a teaching facility where students learn about medical fitness and the relationship between healthy lifestyles and patient care.